Happy 12th Birthday Baby Girl! 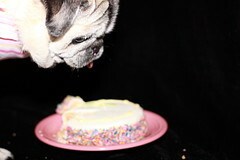 We celebrated Baby Girl’s 12th (yes I said 12th) birthday today with a yummy cake from Bone Appetit Bakery! 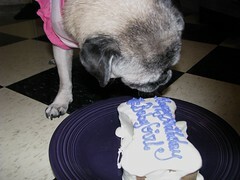 If you had told me three years ago that she’d make it to her 12th birthday, I would have seriously doubted you. She has made it through dental surgery, stent surgery for her collapsing trachea, back issues, and just general old age. She lives every day like she has us in the palm of her hand, oh wait, she does! She is the tiniest, most demanding pug that I’ve ever known. She bosses us around all the time and for the most part we do whatever she tells us to do. 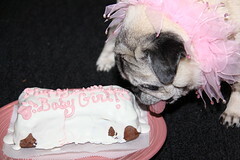 Happy Birthday to our Baby Girl! 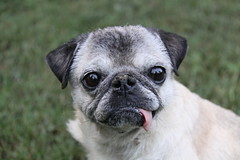 To learn more about pug rescue and hospice pugs visit Southeast Pug Rescue & Adoption. To learn more about Collapsing Trachea visit Yorkie Angel Patrol. Here are some photos of Baby Girl from our mini photo session. I was trying to get a good photo of her to send in for the Yorkie Angel Patrol calendar for 2011. For her to be so tiny, she is also so un-cooperative when it comes to taking her picture. This is my guide to helping you through the many facets of canine collapsing trachea. I am not a vet and this information is not intended to diagnosis CT or to be a substitute for veterinary care. And I know that these precious little creatures are our babies, but for simplicity sake, I am going to refer to our four legged friends as dogs. I have put this information together based on my own personal experience or from the information I have received from others who have had CT dogs. Collapsing Trachea: You may not have even known that a dog’s trachea could collapse or what that a collapsing trachea meant, until…someone told you your dog has CT. Symptoms: Either your dog has a hacking cough or your dog has had syncopal episodes. Some dogs develop a cough over time. It starts out as an occasional cough and develops into a more frequent cough. CT is also characterized by the ‘goose’ honking sound. For my own personal observation, my dog would culminate the cough with a sound much like a cat hacking up a hair ball. Or the opposite end of the spectrum is that your dog has been perfectly fine, but has a syncopal episode where they pass out from lack of oxygen. Either way, it is scary and frightening to watch your dog go through this. Diagnosis: Just because one vet says your dog has CT, you need a second opinion, regardless of how much you love your vet. Many a dog has been misdiagnosed. •	Observation: How many times have we taken our sick dog to the vet for them to miraculously recover? A dog’s adrenaline increases when they visit the vet and increases their airway and voila-no more coughing. I suggest getting a video of your dog coughing. Most cameras and cell phones have a video mode. Documenting your dog’s cough will also help you in the future access assess the progression of the condition. •	X-rays: Radiographs are the second line of diagnosis, but I say this with caution. An x-ray is capturing a precise moment. Either your dog inhaling or exhaling or something in between. Depending on the timing of the x-ray, your vet may or may not get a clear diagnosis. Some dogs have been misdiagnosed from x-rays. But I am going to contradict myself, and say that an x-ray is a starting point. Once your vet has some film they should consult with a specialist. They should be able to email the film and medical history for a consultation. •	Specialist: CONSULT A SPECIALIST! *** If your dog is critical, get to a specialist. This may be in the form of a veterinary college that has experience with CT or a private practice vet that has worked with CT dogs. A specialist will scope your dog. This is different than putting a tube down their trachea. They will inflate your dog’s lungs and insert a scope with a light and a camera to observe where the collapse is located and the severity of the collapse. They will also give you a grade of collapse. Options: Once you know what grade collapse your dog is and in what location-upper or lower or bronchial collapse you will have a better idea of what you are dealing with and make informed indecisions from there. •	Natural Remedies: this usually comes in the form of supplements and dietary modifications. Most supplements don’t have medical documentation to back up their claims so I would say to proceed with caution. There isn’t going to be an herbal cure to CT, but it may provide some relief for your dog. Or help to strengthen their body for good overall health. 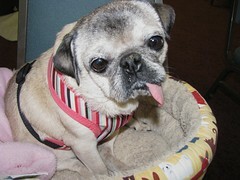 •	Pharmaceuticals: There are many bronchial stimulators or pain medications that can be used to manage your dog’s cough. Consult your vet for a medication regimen. But if you aren’t getting the results that you desire, work with your vet to modify the dose or medications. You are your dog’s advocate. But no matter the medication, there is no magic pill that is going to reverse CT.
•	Surgery: There are options for rings and stents. There are several things to consider for surgery. Does your dog have any other medical conditions? The severity of the collapse (Grade)? The location of the collapse? These things will all be factors that you’ll need to discuss with the specialist to determine if you want to move forward with surgery. Most specialist specialists won’t consider surgery until your dog is Grade III or IV. Even with surgery (rings or stent), there is not a guarantee to the outcome. Some dogs have done great, some have not. This is a personal decision. Also, it is good to know that your dog will always cough, regardless of the surgical option pursued. What you can do: There are many things that you can do to help with your dog’s coughing episodes. •	Weight: get the extra weight off your dog!! I know that we all love a cuddly belly, but the extra weight means extra strain on your dog’s body. CT is already straining their trachea, heart, and lungs. Don’t make it worse. Fat accumulation causes increased stress on the trachea, and weight loss is the number one thing you can to SERIOUSLY improve CT symptoms. Be realistic, most people don’t want to believe that their dog needs to lose 1 or 2lbs. If you do start your dog on a diet, consult your vet and take it slow and steady. •	Harness: I never put a collar on my dogs except for fashion purposes. I highly advise that when you walk your dog to use a harness. Even if your dog does not pull when walking, I think that a harness being down lower on their neck is a better option. I also insist that when they are at the vet’s office not to use the slip leashes around their neck. •	Environment: if your dog gets overly excited and starts coughing when visitors show up at the door, then it is up to you to limit when visitors come over. There may be some lifestyle changes that you need to make or to at least make your family and friends aware to call you before they come over because ringing the door bell causes your dog to go crazy and get overly excited. You’ll be able to identify what upsets your dog and causes them distress. 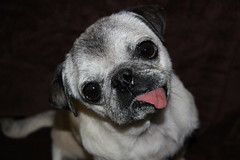 There are medications your vet can prescribe to help with this. •	Allergens: I would suggest getting a good air purifier. If pollen and dust aggravates your dog then an air purifier should help reduce the allergens. Most small purifiers are for average sized rooms and will be fine to keep in the room that your dog spends the most time in day/night. •	Humidity: The HVAC industry states that the proper humidity for inside a home is between 55-65% relative humidity. You can get a humidistat at Radio Shack or on-line. Some will have secondary sensors that you can put in other rooms in the house. I found that in the winter, when the heat was running, the humidity would drop below 50% and my dog would cough more. Sometimes when the humidity was high, my dog would have a wet cough. Depending on your climate, you may need to supplement with a humidifier for dry areas of a de-humidifier for wet climates. •	Salt Lamps: Do a Google search. The small/medium sizes should be good for an average sized room. Salt lamps are said to give off negative ions to neutralize positive ions in the air. They are also said to have a relaxing energy to them. They are good for dogs that get anxious during a storm. They neutralize the energy produced by storms. I don’t really know how they work, but I have one for the room where my dogs stay during the day and one in my living room. Finally, I would say that you need to monitor your stress level, which can be hard to do. As we get tense, our dogs pick up on it and can further trigger coughing episodes. Find a support group-whether it be your family, friends, or an on-line group. CT can be a long and stressful journey and you will need people around you to support you in the tough times. And to celebrate in the good times too. ***My vet, Dr. Katie Linderman, at Standifer Pet Hospital worked very closely with University of Tennessee Veterinary College to diagnose and treat Baby Girl before and after she received the Infiniti Titanium stent. I can’t say enough great things about the staff, students, and vets at the UT Small Animal Clinic. If you can’t travel to UT, then I would suggest your vet contact UT for a specialist in your area for a referral. ***Extra special thanks for Dr. Patricia Sura for reviewing this information. You are currently browsing the archives for the Yorkie Angel Patrol category.